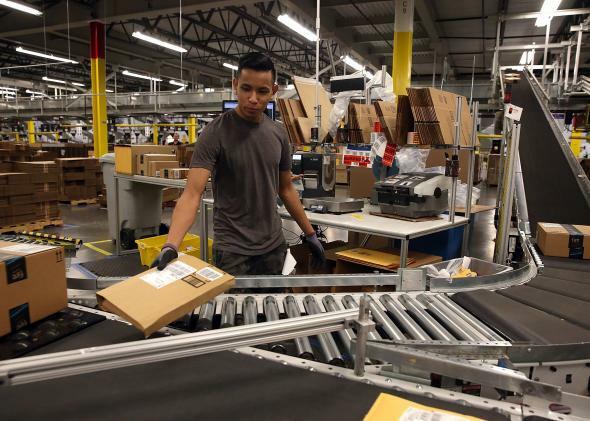 Department of Transportation: Online shopping is clogging America's roads. That package has to get to you somehow. Those of you ordering batteries on Amazon because you’re too deep into a Netflix binge to get off the couch are often blamed for the demise of the neighborhood store. Now you can add another crime to your rap sheet—you’re also ruining the roads. And delivery drones aren’t going to fix the problem anytime soon. The U.S. Department of Transportation released a highly tech-focused report this week, “Beyond Traffic,” that aims to move the conversation about America’s aging transport system out of the 20th century. The report looks beyond the impact of so-called millennial lifestyle trends like ride-sharing and America’s moribund infrastructure, projecting that by 2040, freight volume in the United States will increase by 45 percent to 29 billion tons. Of course, freight includes the moving of grain from the Midwest to the Gulf Coast, among other things, but the report also notes that the increase in online shopping and accompanying home package delivery is a real factor in congestion on our roads and highways—particularly as shopping on a phone or laptop has begun to replace the weekly household trip to the store. In a fireside chat (to which he arrived in a self-driving car) at Google in the Bay Area on Monday, the U.S. Secretary of Transportation, Anthony Foxx, told Google Executive Chairman Eric Schmidt that whatever you buy online has to get to you somehow. “We’re still trying to understand the impacts of e-commerce on miles traveled in the system,” he said. Could drone home delivery solve the problem? In just one paragraph out of a 316-page report, the Department of Transportation notes that Amazon, Google, and DHL are investigating package delivery by drone, but while it could be useful for getting freight to remote locations, the report puts the brakes on urban drone delivery: “Delivery by unmanned aircraft in dense urban environments presents significantly greater security, safety, and privacy risks, and will likely take longer to develop.” While widespread commercial drone use is likely for tasks such as pipeline inspections and moviemaking, it adds that the use of unmanned aircraft in the civil sector will require high safety and reliability standards. Foxx suggests that “Beyond Traffic” is not a blueprint for where we need to go—it’s the beginning of a vital discussion about moving America in the 21st century. It will be a conversation that includes Uber, automated ports, and driverless cars, but delivery drones? We’re not quite there yet.